natural light permeating window walls, and study the nooks and crannies for extra space, such as under staircases or by introducing lofts. Armed with your brief and wish list, designers begin planning, making sure that they are maximising the available space to meet both the quantitative as well as qualitative programmatic requirements of a space. (Above left) Architects at (de)CoDe relocated the original door of the guest bedroom so that it gets privacy and at the same time, the living room doesn’t become a passageway. The original doorway has been converted to a two-way bookshelf/display unit. The use of frosted glass has been incorporated to allow light into both spaces. Image courtesy, Sameer Tawde. (Above right) In a project by Studio GSA architects; Open and connected views of the living room and entrance court through the dining area make the pace seem larger. Image courtesy, Sanjay Ramchandran. (Below) The centrepiece of The Organic House designed by White Room Studio is a long, curved, contemporary sofa, that wraps around the living room and is nestled among the vaulted surfaces, leaving the central space free. Image courtesy, Sameer Tawde. 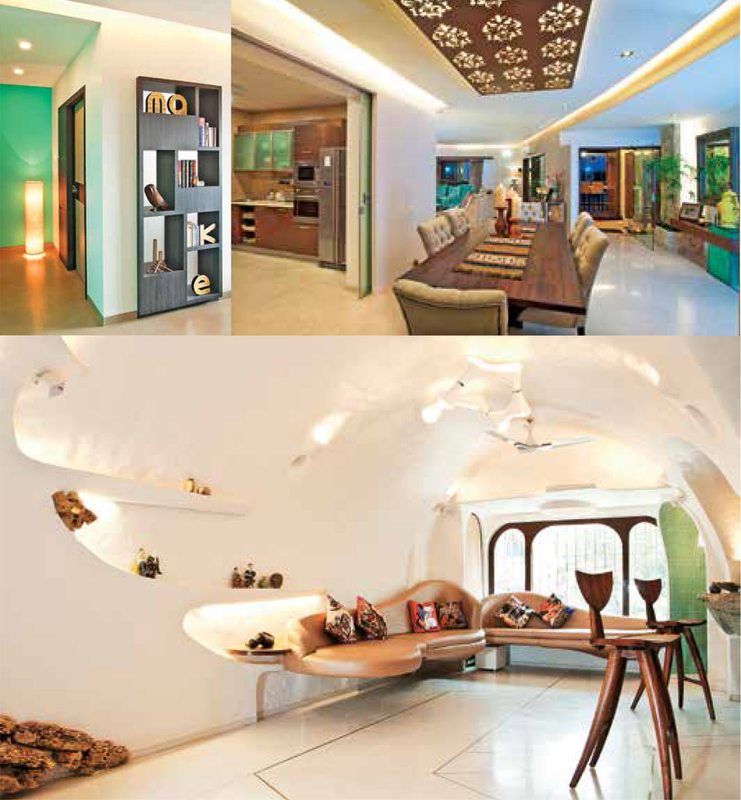 Talented designers have turned smaller spaces into compact yet cosy homes, boutiques and offices. Here, we will look at various thoughts that epitomise the idea of doing more with less. To read further download a copy the article (128 Space Conservation) from this month’s Jet Airways inflight magazine Jetwings May 2014. This entry was posted in Architecture, Design, Indian Art and Architecture, Interior Design and tagged (de)CoDe, contemporary indian architecture, interior design, Jet Airways, Jetwings, less is more, planning, smaller spaces, Studio GSA Architects, White Room Studio. Bookmark the permalink.